South Goa Hotels: A Great Vacation Is Waiting For You! Goa is regarded as the beach capital of India. The long never ending beaches and the shacks serving alcohol and food make it one of the most happening places to be in inside India. Goa with its charm, not only attracts Indian but tourist from all over the world. The Goan culture is yet another factor that sets it apart. A mix of Portuguese and Indian cultures characterise Goa. Goa was once a colony of the Portuguese and has inherited some of their customs and cuisine features.The night life in Goa offer parties that are famous all across India. Galibaga Beach: Galibaga beach has earned its fame due to some endangered Olive Ridley turtles that have nested on the beach. Consequently, the beach earned its name of the Turtle Beach. Galibaga Beach is regarded to be one of the cleanest beaches in Goa. The low population and dense pine trees make this beach a place for the ones who want to avoid crowded places and seeking seclusion. The beach offers privacy, sun bathing, swimming and beautiful sunsets to watch. Agonda Beach: Yet another beach that is popular due to the endangered Olive Ridley turtles, Agonda Beach is not like every other beach of Goa. It offers beautiful sunset for its tourists to view. But, what sets this beach apart is the absence of long waves and hence the lack of swimming activities. Although, it is lacking swimming activities, one can play beach games, take a walk by the sea on the golden sands of the beach, eat from the shacks by the sea, ride on horses etc. Benaulim Beach: Benaulim Beach is located 2km away from the Colva Beach. Inspite of being closely situated to a much popular beach, Benaulim Beach has somehow managed to avoid the crowded nature that Colva exhibits. It is much quieter and has long stretches of beach with white sand pine trees. Due to the rough waters, the beach is a popular water sports destination. The shacks situated by the beach offer Goan food and the option to shop for souvenirs for the tourists. Bogmalo Beach: In spite of not being too long, the Bogmalo Beach manages to be quiet and tranquil. It serves perfectly for the purpose of sunbathing and watching the natural scenery. The islands close to the beach have clear waters that emerge to be ideal for underwater sports like scuba diving and snorkelling. Cotigao Wildlife Sanctuary: When we talk about Goa, we usually talk about its beaches and its culture. But, Goa does have rich wildlife as well. The Cotigao Wildlife Sanctuary is one such example. It is the second largest sanctuary in Goa. The vegetation in this sanctuary is evergreen and so thick that even sunlight does not penetrate. Activities like hiking, talking to tribals and photography are common in the sanctuary. My Sea Side Hotel: My Sea Side Hotel is a hotel situated in South Goa. The hotel has the unique Goan culture on one side and blue seas on the other. It offers one category of room- Standard AC rooms. This hotel is about a minute away from the famous Baga Beach of Goa. Belmonte: Belmonte is the only resort to have all accommodations in suites. They claim to have the largest rooms in all of Goa and have them follow a white theme. The hotel is ideally located for its guests to visit several beaches like Chapora beach a mere 2km away and Anjuna Beach a mere 3km away from the hotel. The Goa International Airport is about 52km from the hotel and the Thivim Railway Station is about 20km from the hotel making Belmonte easily accessible. The hotel is rated 3 stars and has 3 categories of rooms to offer, these are deluxe suite, superior suite and premium suite. 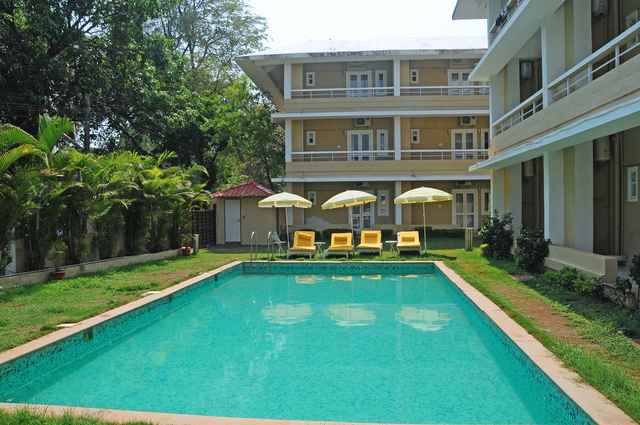 Zense Resort: Located near the Candolim Beach, this is a 4 star hotel. They offer 2 varieties of rooms in Luxury Rooms and Master Suite. Grand Hyatt: Grand Hyatt is a hotel that looks over Bambolin Bay and hence provides some excellent views. A property that spreads over 28 acres, Grand Hyatt has on offer a large number of rooms and to notch service. The Garden Suite has a Jacuzzi in it and the whole property can be travelled using a buggy. A 17th century chapel present on the premises blends wonderfully with the modern setting of the hotel. This hotel also has restaurants and bars on the offer along with a casino and a spa. Country Inn and Suites: Country Inn and Suites has the Candolim Beach at 10 minutes of walking distance. It offers meals at the hotel premises and a poolside Barbeque facility for the ones who desire. Country Inn and Suites is a 4 star hotel that offers 3 varieties of rooms in- Standard Rooms, Deluxe Rooms and Superior Rooms. Atlanta Beach Resort: It is a 2 star hotel offering 3 variations in rooms that are- Standard Room Non-AC, Standard Room AC and Suite Room. The attractions of South Goa attract several tourists all over the world. The South Goa Hotels add to the feel by their top notch services making South Goa a must visit destination!